The 17th annual Southern Illinois University Edwardsville Sculpture on Campus program will delight once again with 10 new wonderful works of sculpture being featured on campus. The three-day event, hosted by the SIUE Department of Art and Design, will be held Wednesday-Friday, Oct. 4-6. The event kicks off with a public lecture by juror and Cleveland-based artist David Deming, MFA, at noon Wednesday, Oct 4. On Friday, Oct. 6, the public is invited to view the installations during the Sculpture Walk beginning at 4 p.m. in front of Art and Design East. Student winners will be awarded prizes during a 6 p.m. ceremony in the Art and Design West Building’s Lecture Hall, room 1104. An exhibition featuring Deming’s work will be held from 7-9 p.m. with an opening reception in the Art and Design West Building Art Gallery, room 1120. The internationally known artist will work with 11 art students who spent the last four months designing, building and installing their outdoor sculptures throughout SIUE’s campus. Participating student artists include Chelsea Belcher, Sarah Bohn, Benjamin Carey, Jessee Crane, Brad Eilering, Dara Garcia, Samantha Hunerlach, Jessica Hunt, Alex Jacobs, Joseph Ovalle and Sarah Walters. 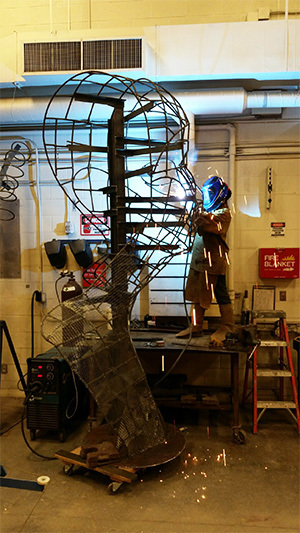 Photo: SIUE graduate student Sarah Bohn creates a large-scale sculpture to be displayed on SIUE’s campus. 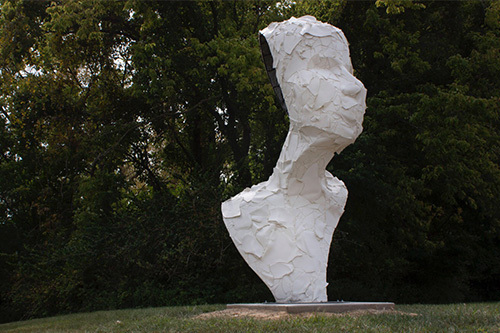 “Bride of the City,” created by SIUE graduate student Sarah Bohn, is among the impressive pieces on display through the Sculpture on Campus program.